Today's European Central Bank rate cut and the low unemployment claims in the U.S. are boosting the price of oil and oil stocks. The Dow Jones Industrial Average (INDEX: ^DJI) is up after the European Central Bank lowered its rates and multiple positive reports on the U.S. economy were released. Fears over a sluggish European economy have weighed on oil prices, so today's news bodes well for the price of oil and related stocks. As of 1:15 p.m. EDT the Dow is up 117 points, or 0.8%, to 14,818, while the S&P 500 (INDEX: ^GSPC) was up 0.96% to 1,598. The one to pay attention is the unemployment claims report. Weekly initial unemployment claims dropped by 18,000 to a seasonally adjusted 324,000. That's the lowest weekly level since January 2008. However, the weekly number can be volatile, so it's generally better to follow the four-week moving average -- which also dropped by a large amount this week, falling 16,000 to 342,250. 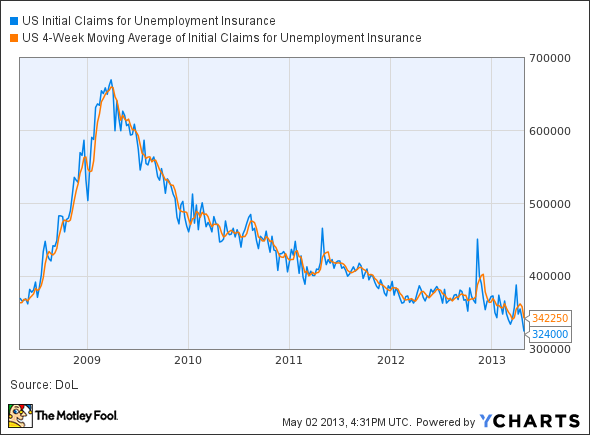 US Initial Claims for Unemployment Insurance data by YCharts. Last year the unemployment claims averaged 360,000 to 370,000 so this is a good sign that the economy is slowly strengthening. The second important piece of news today was that the European Central Bank lowered its main refinancing rate from 0.75% to 0.5% in an effort to spur the sluggish eurozone economy. The ECB also lowered its marginal lending rate -- the rate at which it loans to troubled banks -- from 1.5% to 1%. The interest rate on the ECB's deposit facility remains unchanged at 0%. Today's Dow leader is Chevron (NYSE: CVX), up 1.5%, while ExxonMobil (NYSE: XOM) is up 1.3%. With their high stock prices, the Dow's oil components have an outsize effect on the movement of the index. Chevron is the second-largest component of the Dow by weight, making up 6.28% of the index, while ExxonMobil is the seventh-largest with a 4.57% weighting. Following today's news from the ECB, oil prices rallied almost 2%, as a stronger Europe should mean more demand for oil. Oil stocks are rising with the jump in oil prices. Brent crude, the benchmark for the international price of oil, is up 1.95% to $101.90, while WTI crude, the U.S. benchmark for oil, is up 2.34% to $93.16. Both oil stocks reported earnings last week. ExxonMobil's results were better than expected, though production declined by 3.5% from the year-ago quarter. Chevron, on the other hand, reported slightly increased production but lower income as a result of refinery repairs and lower oil prices.